Life was fun, and there was plenty to do…There were sporting events, festivals, and dances. 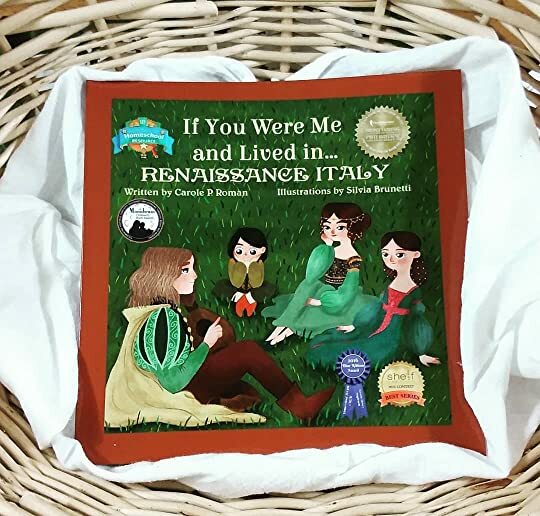 In this delightful little story, “you” are transported back to Renaissance Italy to learn all sorts of cool facts about everyday life back then. There’s so much information about the fashion, jobs, adventures and art of the time. The author weaves in facts that are both familiar and totally alien to this day and age. Also, the illustrations were absolutely lovely! (And illustrations so often make-or-break a children’s book!). Your cook seasoned the food with cinnamon, cloves, nutmeg, saffron, and pepper…she used oranges and lemons from your orchard in the country to flavor the sauces…She made noodles every day…. I also really enjoyed how Roman talks about the entire family’s careers – from Papa’s shop to Mama’s beauty routines – there was a lot to be learned. There’s even a fun little appendix at the end for all sorts of cool facts about the artists and even more information about common Renaissance Italy terms.